The FED-STD-595C Specification Document, or “Spec Book” for short, is a valuable tool for anyone using FED-STD-595. It contains application information, numeric color data, common names for many colors in the spec, and more. 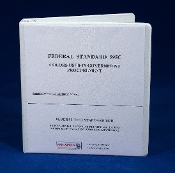 Spec Books are frequently purchased by companies to show full FS-595 compliance for Quality Audits. We offer two versions of the Spec Book: While the Economy version may be adequate for some users with basic needs and limited budgets, the Classic Plus Edition is our flagship product. 1) Appendix-IV, the “Master Color Table,” originally included tristimulus data that was incomplete, riddled with transcription errors and generally of no real value. That’s all been replaced by a set of high-precision L*a*b* measurements for all 650 colors. RGB values for approximating FS-595 colors on a computer monitor are also provided. 2) The original version of FED-STD-595C provided names for some colors, which can offer a useful cross-reference. This name-list has been substantially extended in the Classic Plus Edition with color-names from numerous other Federal Specs and public sources. 3) A new “Supplemental Materials” section provides a sort-by-name version of the Master Color List, a quick-ref chart to show what gloss levels are defined for each shade and a FAQ section with answers to many of the questions we’ve been asked about FED-STD-595. 4) A complete copy of FED-STD-141D is also provided, along with an unedited copy of FS-595C for reference and a 6-page "Change Log" reflecting the modifications we’ve made. Color samples are taken from the GSA version of the Spec Book, meaning they are individually printed and arranged in a 3x10 grid pattern on 8.5 x 11-inch pages. Please note these samples may contain small errors and are not intended for QC or Inspection purposes; that is the job of 3x5-inch Color Chips. In summary, FED-STD-595C Classic Plus Edition is the most complete, accurate and useful version of this spec that has ever been released. Everything is provided in a 3-ring binder, and Change Notice 1 is fully incorporated.